"TIEMCHART is an online project management software for small to large-scale organizations. Organize everything you need to complete your project on time and within the budget." TIEMCHART scored 72/100 in the Project Management category. This is based on user satisfaction (91/100), press buzz (30/100), recent user trends (falling), and other relevant information on TIEMCHART gathered from around the web. TIEMCHART is a web-based project management software solution developed for all types of business, regardless of size or industry. With impact upon the engineering industry, management and/or project consulting firms, construction companies all the way to small startups, freelance professionals and individual users, TIEMCHART offers the tools and features these organizations need to manage projects as easily and efficiently as possible. The web-based solution incorporates a number of the more crucial capabilities of different platforms such as collaboration tools, project management, accounting systems, scheduling, budget and resource management solutions and more into a single platform that is easy to use and affordable. As an online or web-based project management platform, TIEMCHART effectively delivers and caters to the needs of SMBs, large enterprise companies and even individual users. It is widely regarded as a good alternative to other more commonly used solutions like MS Project and Oracle Primavera, which are designed for larger enterprise businesses. TIEMCHART comes equipped with a variety of features and capabilities, including advanced Gantt chart tools for managing tasks and resources as well as a timesheet management solution complete with a billing and costing module. The project management platform is available as Software as a Service (SaaS) or on-premise deployment. The former allows users to set up and access the software solution via the web anytime and anywhere, while the latter requires the TIEMCHART project management platform to be installed on a company server. TIEMCHART project management offers a wide array of tools and features, making it a well-rounded and highly functional software solution for businesses and individuals who need an easy but reliable way to efficiently manage projects. Gantt charts are designed to help you visualize as well as organize your tasks. It lets you keep track of current ongoing projects and monitor progress. 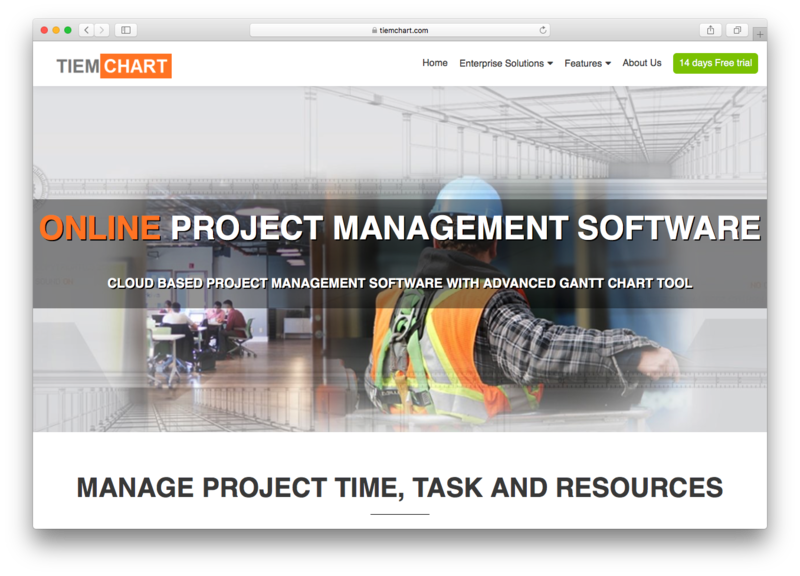 TIEMCHART offer the Gantt chart online feature, which essentially enables users to plan, manage and carry out projects on the go. The Gantt chart online feature allows for intuitive project planning and scheduling, easy set up of the predecessor or successor to individual tasks, and the ability to calculate free float, total float, earliest and latest start and so on without difficulty. TIEMCHART’s project accounting software is a costing to billing solution that allows businesses to take full control over their project costing and financing. It provides a user-friendly cost-estimating tool designed for different types of expenses and resources, which lets users maintain a fairly accurate cost estimate whether at the resource level or at the activity level. Additionally, the project accounting software also comes with a built-in job costing tool designed for entering cost information at the resource or expense level. Project billing is another component of the software solution, which facilitates the billing for time and/or services rendered, regardless of your business model, revenue stream or industry. The resource management software system allows you to have a comprehensive view of your company’s available resources and workload. With the resource tracker, you have access to resource scheduling and time tracking, which means you have human, asset and material tracking capabilities. TIEMCHART’s resource management software comes with a team planner tool. It gives you a clear vantage point to determining available resources and workload. This way, you are able to balance out the overused and underutilized resources to improve efficiency and productivity. The timesheet system has fully integrated time tracking and approval tools to give you a much more practical view of both billable and non-billable hours. The resource accounting system, on the other hand, provides complete control over project costing concerning human, asset and material resources. Task Tracker is a task management solution designed for quick and efficient management process for both tasks and teams. TIEMCHART’s task management solution boasts next generation technology for monitoring teams and tasks. It comes with multiple level task monitoring capabilities and allows users to set up the predecessor or successor of each individual task. TIEMCHART provides businesses, big or small, with a comprehensive project management platform that completely delivers on all important aspects in the world of human, asset and material resource tracking and management. It enables companies and organizations to cover all their bases and keep every aspect of their project under control, including expenses and resource utilization. The simplicity of its overall design and the ease of use are what set the project management platform apart from other similar software solutions in the market. The utilization of the Gantt chart, which virtually everyone in the world of business is already familiar with, only adds to the user-friendly design. Developing and creating a project plan is quick and easy. It doesn’t require any extra skill or knowhow and it has a much shorter learning curve, even if you have no prior experience with project management systems. The built-in Gantt chart online tool lets you plan and manage single or multiple projects with relative ease. 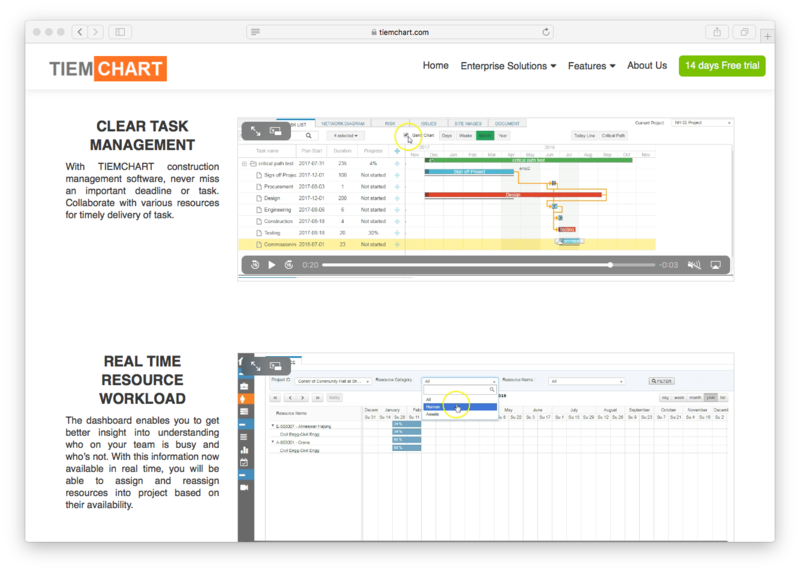 TIEMCHART allows you to modify specific tasks, schedules and allocation of resources, as well as set dependencies in order to maximize asset utilization and nail down more efficient workflows. And since everything is visualized with the Gantt chart system, all of these processes are simpler and easier to digest not only for you, but for your team, stakeholders and decision makers as well. TIEMCHART is available in two simple pricing options: a per-user license and a per-project license. There is no premium pricing for added features and there is a 14-day free trial available. The licensing fees are billed either quarterly or annually. Visit the TIEMCHART official website for more details about the web-based project management platform. Interested parties may also sign up for a scheduled weekly live demo. TIEMCHART online project management software offers a wide range of features and capabilities suited for small to medium-sized businesses, large enterprise companies and small startups in different industries. It takes full advantage of the Gantt chart tool to help users manage projects, tasks and resources. In addition to the Gantt chart tool, TIEMCHART also comes with scheduling, billing and costing modules that are robust and easy to use. It is available as Software as a Service or an on-premise platform, depending on what you need. The SaaS solution gives you and your team complete access to the system anytime and anywhere. What platforms does TIEMCHART support? Does TIEMCHART offer multi-user capability (e.g. teams)? Does TIEMCHART integrate with any other apps? Does TIEMCHART offer guides, tutorials and or customer support?